Twenty-four-year-old Masaba Gupta vividly remembers going through a rough time in design school. She wasn’t too good at cutting and sewing, and her designs weren’t getting great feedback. “I was lost in class. Everyone found my designs too over-the-top. I was constantly told to change them and do something more commercial,” she says. 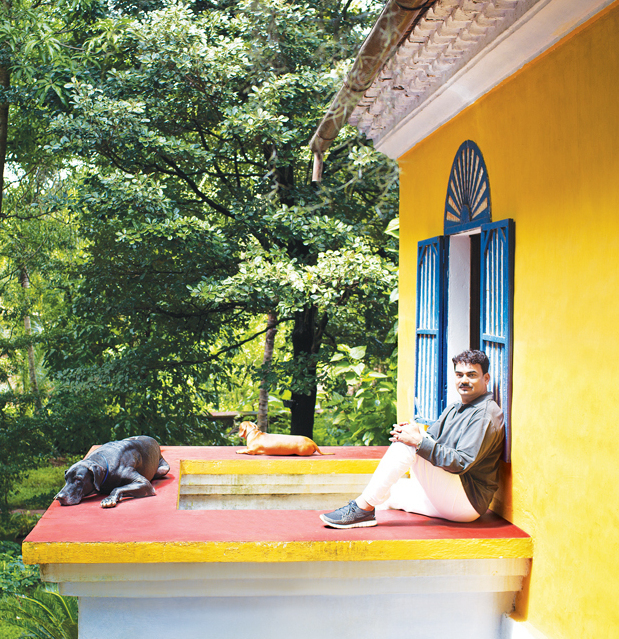 But, one of her professors at SNDT, Mumbai, thought otherwise — Wendell Rodricks. “He was the only one who kept telling me, ‘Don’t touch anything and don’t change your style. You’re going to make your mom very proud,’” she recalls. His prophecy was absolutely correct. Gupta’s unconventional concepts, such as the Tamil script on saris or the camera print on blazers, were a rage from the get go. Rodricks, I imagine, was speaking from experience. Few have broken the rules of fashion like him, and even fewer have met with the kind of success he has. Anjana Sharma, COO and design director of Stylista.com, says that the collections Rodricks designs for her fashion portal are hot favourites. “They are classic and cut across all age and size brackets,” she says. It wasn’t always so. There was a time none of his garments found takers. His humble cotton and linen offerings paled in comparison to the embroidery-laden designer wear that had flooded the market. And, when blindingly bright colours were the flavour of the season, Rodricks offered muted blacks and whites. But, he stuck to his guns, and the risk paid off. In his personal life too, he’s been a trailblazer. Back in the 1980s, when homosexuality was a topic discussed in hushed tones, Rodricks was unapologetic about his relationship with Jerome Marrel, a Frenchman he met in Oman. The couple lived together for years before formalising their relationship in December 2002 by signing the pactecivile de colidarite, recognised by French law. Being India’s first openly gay celebrity is bound to have attracted a lot of attention, mostly unwanted. His public outing, so to speak, happened after an article by Shobhaa De made his sexual orientation known to the entire nation. Rodricks’s parents were always aware of the truth, but weren’t happy about it being flaunted publicly. “My family was upset at me being outed as they had not dealt with the spotlight, especially about my sexuality. But, they recovered rather quickly. They have enormous respect for me as an honest person,” says Rodricks. One of the criticisms levied against the designer’s 2012 tell-all, The Green Room, is that he made growing up gay in a pre-liberalised India sound too easy. He offers no accounts of coming out to his friends or family, which many considered a cop out. In his defence, Rodricks says he never had any sob stories to write about. “Gay and straight people who knew me, then and now, know that being gay was no great deal. I was looking for love. Everyone knew that. So, speaking about growing up sexually in The Green Room was a bit of a laugh for my friends and me,” he says. What the book does provide is an extensive account of his travels and food expeditions with his partner of nearly three decades. Early this year, while the fashion industry was abuzz with news of his Padma Shri, a blissfully unaware Rodricks was somewhere between Tonga and New Zealand, making merry with his Scottish friends on a luxury cruise. Long after his inbox was choked with congratulatory messages did he learn of his achievement — he’s only the second designer after Ritu Kumar to be bestowed this civilian honour. “I cried. I was melodramatic. I got pissed on champagne and vodka the day the news reached me, but I survived the hangover and moved on,” he says over email, a few hours before jetting off to yet another destination. There are few corners of this world he hasn’t graced as yet. To be precise, he’s covered 150 countries of the 190 registered by the United Nations. That said, those who know him closely say Rodricks remains a simpleton. “He’s grounded and has a sound middle-class upbringing,” says Sharma, who accompanied him when he received his Padma Shri. “He was so emotional that day. I too wept buckets. He was being honoured not just as a fashion designer but as an artist. Given that he’s openly gay, doesn’t have too many mai-baaps to tout his case and doesn’t make in-your-face bridal wear, it felt so amazing,” she says. In September, Rodricks was conferred another prestigious title, this time by the French government — the Chevalier de l’Ordre des Arts et Lettres. “It would be a lie to say that these awards don’t mean much. They do. They thrill you and intoxicate you with happiness. But, after a few days, the reality of life pushes that euphoria away,” says Rodricks. With so much to look forward to, one wonders if the designer’s autobiography came out a tad early. Rodricks disagrees. “I am not one to have regrets. I wrote The Green Room to celebrate 25 years of being in the business. Maybe, at 30 years, I will have more memoirs to pen.” Given the breathless pace at which he operates, that book may not be too far away.